In addition to the architectural concentration of courses, the architecture curriculum also touches on related disciplines of engineering, interiors and landscape. I had a combined landscape/interiors course that taught us enough to be dangerous. We all referred to that class as “stumps and stools.” It did give us an appreciation for those design disciplines and a vocabulary that let us communicate in their vernacular language. But when we need the real thing designed, we engage those professionals that are fully trained and versed in the discipline. So for landscape we retained Howard Fairbairn Site Design and worked with Scott Howard/Landscape Architect to achieve the landscape design and construction documents. I debriefed with Scott to get a rundown on the landscape solution and documents. The landscape was a part of the LEED approach to design and played a role in achieving key certification points. The design of the landscape needed to be concerned about the use of water. One of the first things to do is reduce the amount of turf area and unfortunately in Oklahoma turf is one of those things that grow quite well. So the design incorporates a lot of beds with low maintenance plant materials; grasses, ornamentals and native plants which once again fit in very well with the architectural palette of stone, glass and steel. In addition to plant materials there are inert materials such as decomposed granite and river stones which are readily available within the Sulphur area. All of those selections combined helped reduce the water consumption but there were some areas where the introduction of some turf as needed and buffalo was selected grass which is more of a prairie grass. It comes in a sod form which makes establishing it immediate and it has a very nice native look. Beyond that plant materials that are hardy to the area were used along with perennials, woody shrubs, ground covers and sedums that are very durable. The design process involves developing drawings to communicate ideas and proposed selections of materials to the client. 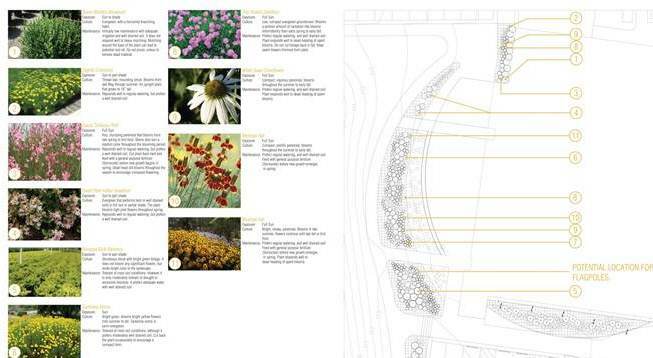 Rendered site plans and palette sheets are used for this purpose. 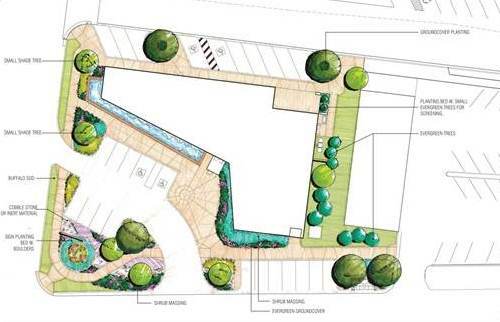 The site plans show the overall concept of landscape, hardscape and their placement. The palette sheets show proposed individual plant materials. The construction documents communicate the types of plant materials and installation. The primary document for this purpose is the Landscape Plan. On the plan you can see the planting beds with designated plants that refer you back to a plans list that shows the acronym for the plant, quantity, common/botanical name and condition which is typically container size, however, trees go by caliper and evergreens go by height. I asked Scott to give me a quick rundown of the plants in the plant list. Shantung Maple; a small to medium hardwood, beautiful fall color, very disease resistant, small fruit but not messy. Bluepoint Juniper; just a good accent evergreen, kind of blue-gray. We try to use a lot of variations in color, texture, and seasonal interest. Taylor Juniper; in the eastern red cedar family but it’s been culled out so it’s a columnar skinny version of the red cedar and nice as a vertical accent. Purple Robe Locus; not one that you see every day but it has pale purple blooms, a pinkish fuchsia color, its unusual, used mainly for its color and drought tolerance. Virginia Sweetspire; a cultivar of Little Henry that’s got a white bloom. Feather Reed Grass; one of our favorites, it’s a Carl Forester, it’s very unique in the sense that it is very vertically upright. You get into switch grasses and maiden grasses and they tend to fall over and be very loose and open. Little Kitten Eulalia Grass; a perennial but smaller version of other grasses. Autumn Sage; lots of variations of color, very durable, almost an evergreen, holds its leaves into winter. Green Lavender Cotton/Santilina; kind of an arid looking plant and a very pronounced odor when you rub it. Big Bang Spiraea; a woody stemmed short, dwarf type shrub. Mexican Feather Grass; very soft and wispy, it’s like hair blowing in the wind and it has a very golden color right now as a fall color. Goodness Grows Speedwell; it has a nice purplish, maroon flower spike. Seasonal color beds for concentrated color and impact. In this plan there were a couple of areas where we knew the client would want to come in with some seasonal color. So we did allow for massings of sweeping ribbons and bands. Seasonal color needs to be done in masses and concentrated for impact. The site doesn’t have many trees. 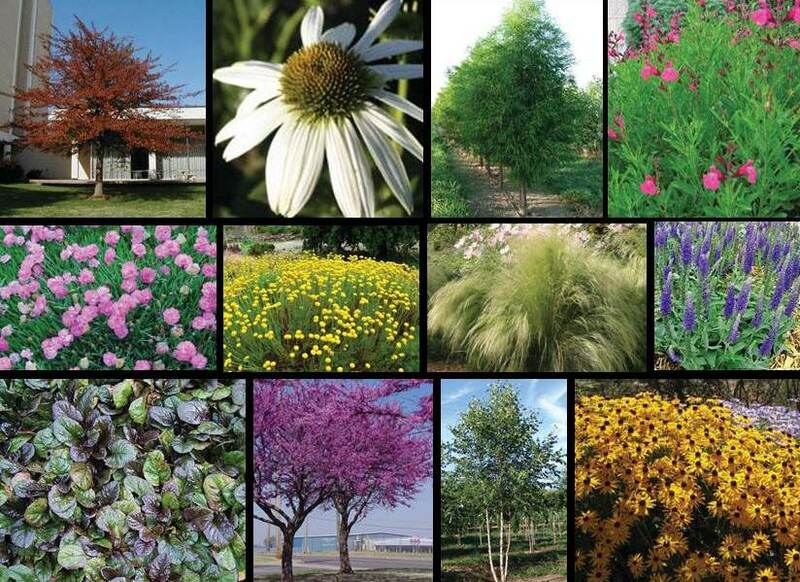 In areas with trees, there needs to be a transitional plan as they grow. At first you can grow sun-loving plants for 5-7 years until the canopy starts developing. Once the canopy is developed, the sun-loving plants are not going to do well so you have to transition to shade plants. There are only some plants that survive both conditions.